This week’s title, a play on “just in time” refers to the role that the Genzyme project played in stabilizing the practice in the aftermath of the change in real estate tax laws that decimated the housing industry in the late 1980s. By 1989, housing projects were being abandoned mid stream and we probably had six to eight projects of over 300 units each stop in a matter of months. I got to see a lot of friends laid off, some times 10 at a time and then I got called into Peter Shaffer’s office. Was it my turn? Peter explained that he had just gotten this new job for a company called Genzyme and he wanted to me to work on it. My response as a brash 26 year old (somehow blocking out the layoffs?) to Peter, “I am not interested in doing interiors and especially not labs.” Peter calmly explained that this was essentially the only work we had coming in and I could work on it or be laid off. The next words out of mouth were, “OK, what’s a fume hood?” I had heard some people in the office talk about them, but I had no idea what they looked like or did. Peter arranged for Henry Fitzgerald, Facilities Director of Integrated Genetics, also a project of the firm, to give us a tour and explain the equipment that goes into a lab. It was an eye opening experience. The labs were not what I imagined at all. My knowledge mostly coming from a high school chemistry lab and the stuff they were researching was really interesting. It would be the first time I worked with Randy, the project manager, who is now one of my partners. I learned a tremendous amount from Bob Dudley about the technical aspects and observed how Jean Edgerly could get the contractors to do almost anything for her by being competent, charming, and never raising her voice. Genzyme had chosen to locate in Kendall Square, a twelve and a half acre site that was being redeveloped by the Athaneum Group. There were 15 historic mill buildings constructed from the 1830s through the early 1920s. “The local Historic commission has identified Kendall Square as a site that represents the evolution of industrial facilities and construction methods over a 100 year period,” noted David Clem, an Athaneum Group Partner, at the time. Genzyme would occupy the earliest poured in place concrete buildings in Cambridge that were almost 400 feet long and slightly bent. The street, shown above with the checkerboard tile pattern, was the main circulation in the space. In addition to the floor pattern, we wanted a consistent lighting strategy. 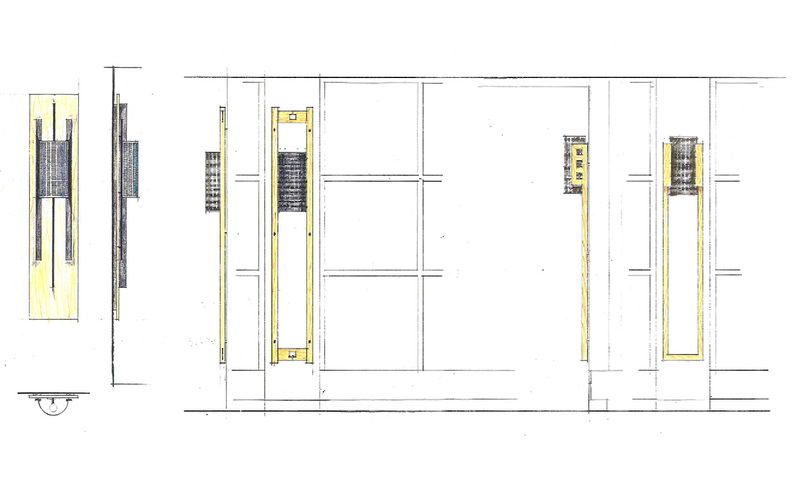 Taking advantage of the exterior columns and my position as draftsman of the interior elevations I saw an opportunity to develop a custom shade that would relate to the design aesthetic and be better proportioned than a stock wall sconce. 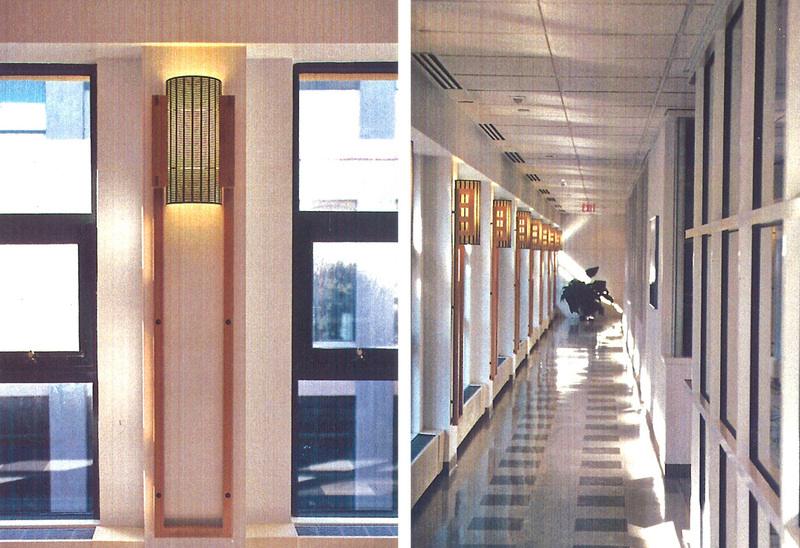 To keep within the budget, it had to be a shade placed over a generic UL rated light rather than a custom fixture. Below are some of the studies that were developed and we built a full-scale mock up. This shows the second phase design that took the oak squares from the furniture selected in phase one. The first design had to be refined to remove oak bars in front of the shade because Henri Termeer, the President, had backed into the fixture while talking with a colleague and hit his head. Custom shade options with the final design on the far right. Final fixture design and a row of them in place in the hallway. To encourage communication between employees, the design focused on the functional layout of the space. 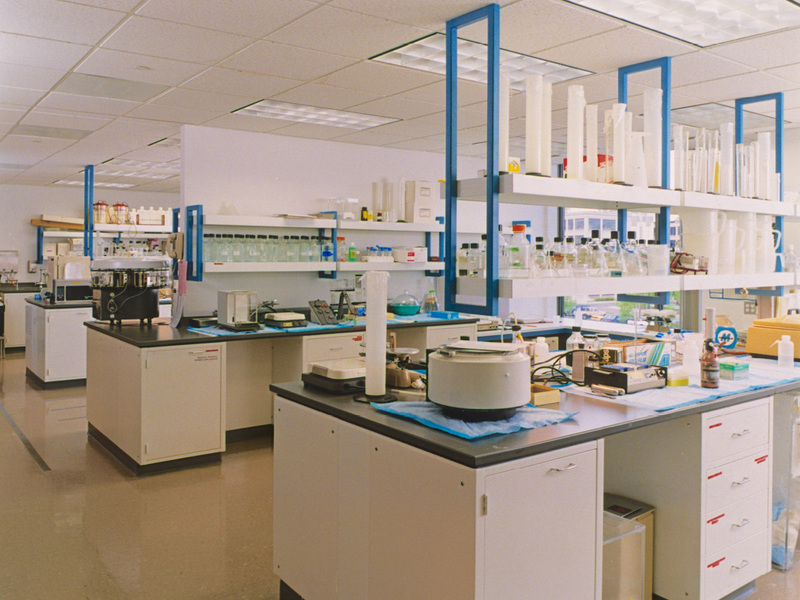 The corporate, administrative and support areas are at the east end of the Genzyme Building, while the laboratories, equipment rooms and scientists are located at the opposite end. 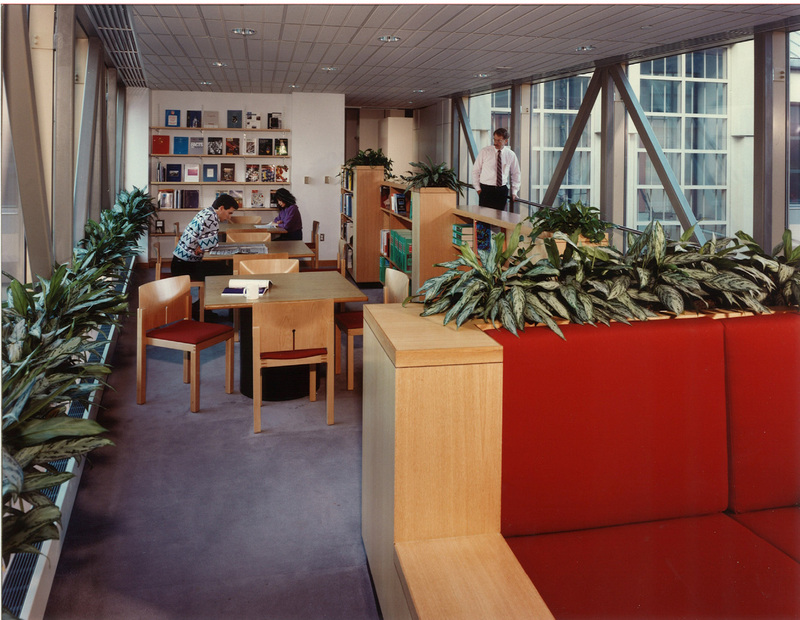 The common areas, combined with the building elevator cores, are strategically located to foster spontaneous interactions throughout the space. A new bridge from the 4th floor of 700 Kendall Square connects the 5th floor of the Genzyme Building at the research end of the office, enhancing the sense of one continuous space. This bridge houses the library, creating a central meeting point for scientists and employees from both buildings. Research Library on the Bridge. Another design element used to encourage communication amongst the staff is an open landscaped stairway located in the Genzyme building, between the 4th and 5th floors. At the bottom of this stair on the 4th floor is the cafeteria, the fifth floor is administration, and at the Mezzanine level, the Board Room. By strategically placing areas such as the cafeteria that are used by both scientists and support staff near the stair, traffic flow on the stair enhances opportunities for employee interaction. 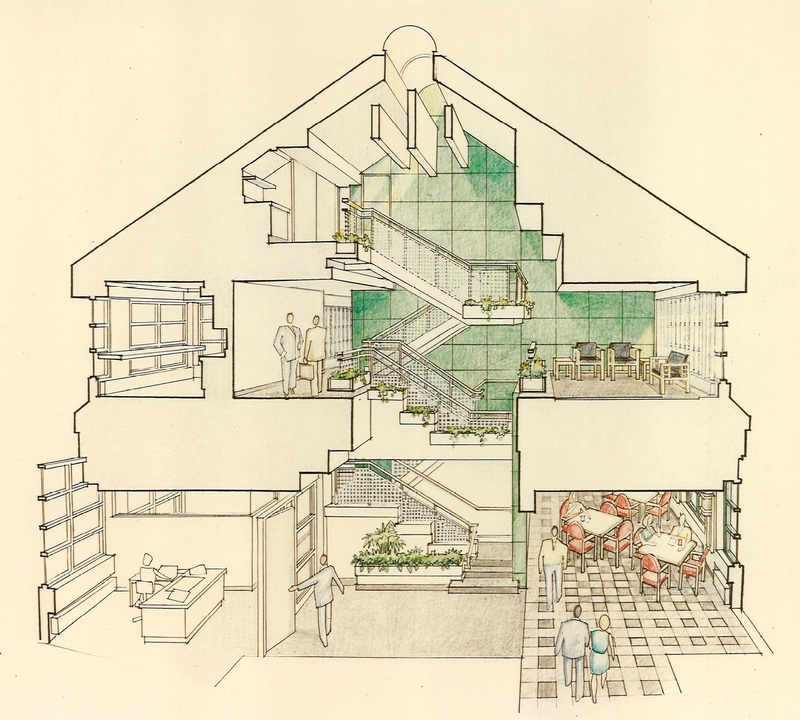 Sectional perspective by Bob Dudley that shows the connectivity discussed above. Lab work would become a staple of the firm over the next few years, building diversity in the practice. Over a period of about three years, I would gain the experience of doing an animal facility for Biogen, offices and labs for Enzytech, Opta Food Ingredients, and Biosurface Technology (now Genzyme Tissue Repair). They took a square inch of your skin and in a week grew three square feet, mostly to treat burn victims. I never knew there were so many industrial accidents. Looking back it was a fascinating journey to experience the science and sense of discovery. 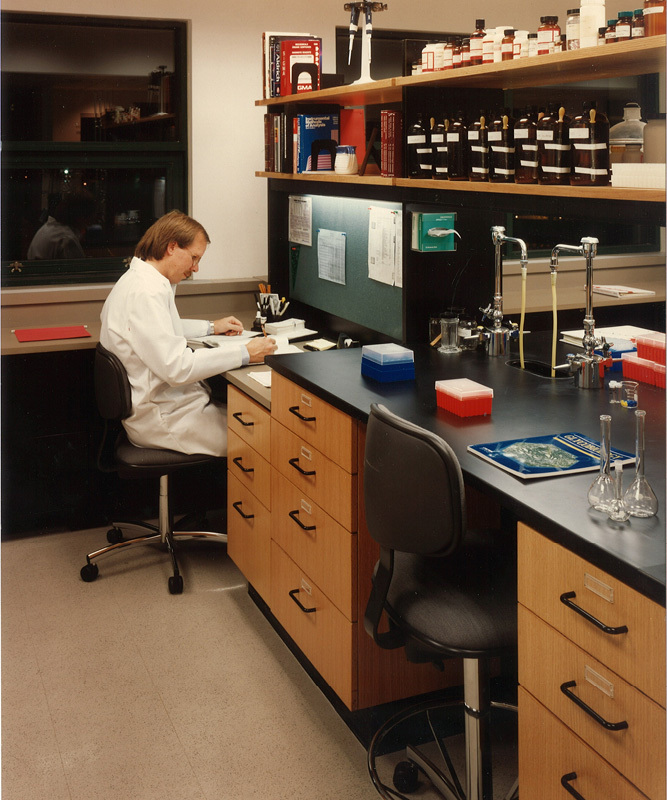 As I mastered the basics of labs, I began to explore more and have more fun designing spaces for processes that might just be getting figured out. As more equipment came to bench top, the supports for the re- agent shelving became more problematic. To free up the bench surface, we developed these hanging shelves (below) for Biosurface, which I was very proud of, until a colleague questioned the concept of apparently hanging something from a suspended ceiling. Ego deflation. The movement of research to the computer has now rendered most of the shelving obsolete. Innovation made irrelevant by innovation. One of things I realized in this four year foray into labs and interiors projects is that when you don’t have to keep water out of the building, you have so much more time to reach a higher level of resolution for the interior, like the custom shades and hanging shelves. I learned from Peter Shaffer about how to locate light switches and outlets to not land in your wood paneling and to prevent thermostats from being centered on the wall where you want the artwork. I learned how to detail millwork from Rem. How to float a countertop, organize drawers, and locate hardware. 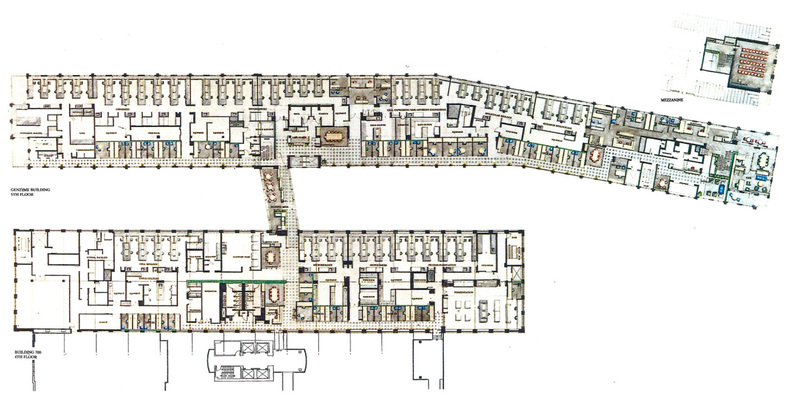 I learned how to draw interior elevations completing more than a mile (5,280 linear feet) of them at ¼ inch scale for the Genzyme project. I learned so much from tackling something that I initially did not want to do. But most of all, I learned the value a having a diverse practice and that is a goal we still aspire to today. It was the right time for a Genzyme. This was a great learning experience for me as well with a great team of Bob, Ed and Jean. The only (really, the only) good thing about a recession, is that the quality of the team members reaches a very high level, as we experienced with this team. One of the best ever! One of the effects of a recession is that the remaining members of the project team are very strong, as it was in this case with Ed, Bob and Jean. One of the best teams ever!